We are remarkable entity, engaged in offering superior quality Intake Manifold Gasket. We are a company which is engaged in the manufacture and supply of a high quality of products such as the Single Layer Steel Gaskets which are made using a high quality of raw materials which have been bought from well known vendors in the market and they have a very sturdy make and they are used for the process of sealing. We offer Manifold Rubber Gasket. In addition to the use of composite materials, such as those types of Gaskets construction are available. These include compressed fibre material based gaskets with appropriate surface coatings and metallic gaskets. By utilising the full capacity of our experienced manpower, we put forward a wide and quality assured range of Intake Manifold Gasket in different specifications at reasonable rates. Our company holds immense experience in this domain and is involved in offering Truck Inlet Manifold Gasket. We are offering to our customers a wide range of Exhaust & Intake Manifold Gaskets. In addition to the use of composite materials such as those for cylinder head gaskets, several other types of gaskets construction are available, these include compressed fiber material based gaskets with appropriate surface coating & metallic gaskets. Being one of the trusted firms in the industry, we are highly engaged in providing a unique range of Intake Manifold Gaskets. In automotive engineering, an inlet manifold or intake manifold is the part of an engine that supplies the fuel/air mixture to the cylinders. The word manifold refers to the folding together of multiple inputs and outputs. We cater the highly efficient Intake Manifold Gaskets in the market. Air Intake Manifold Gaskets are set between the air intake manifold, the cylinder heads and the block in a gasoline powered internal combustion engine. 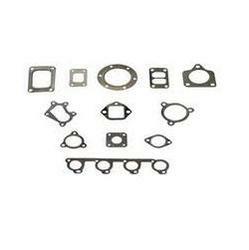 We are one of the distinguished Manifold Engine Gaskets Exporters in India. We are a prime Manifold Gaskets Manufacturer, Exporter and Supplier located in India. The Manifold Gaskets offered by us are used to seal engine block. Our Manifold Gaskets are units, which collect engine exhaust from multiple cylinders and deliver it to the exhaust pipe. Further, clients can avail Manifold Gaskets at industry leading prices from us.